While melatonin supplementation has been known to have positive effects on adjusting sleep cycles and assisting with jet lag, the substance is also believed to have a positive effect on pregnant women. This hormone, produced naturally by the human body is said to—when also taken in oral dosages—not only help with fertility levels, but can potentially offer significant health benefits to expecting women and their unborn fetuses, including reducing the effects of oxidative stress. The hormone’s primary function is to regulate a person’s sleeping patters. Though it is produced by our brains and found in a number of foods we consume, melatonin is also readily available in oral preparations that can be obtained without a doctor’s prescription. How much of the substance our bodies produce depends greatly upon on a person’s sleep cycles, the time of year it is and how much light they are exposed to. The drug is commonly used to treat insomnia. Why is the Drug Valuable to Pregnant Women? In many instances, expecting women face insomnia to a certain degree. For some women, this lack of sleep becomes problematic and potentially unsafe for the health of both themselves and their unborn children. In such cases, either prescription or over-the-counter sleep aids could be recommended to circumvent insomnia. However, anti-insomnia drugs could become habit forming, elicit a number of untoward side effects and possibly have a deleterious impact on a fetus. Due to the side effects of many sleeping medications, many women either living under or fearing these circumstances take melatonin as a natural remedy. In addition to assisting as a sleeping agent, melatonin studies have found that this hormone can help reduce oxidative stress, acting as an antioxidant and scavenging free radicals. In animal studies, it has been shown that melatonin supplementation can decrease the risk of preeclampsia, preterm birth and intrauterine growth retardation (IUGR). These same preliminary studies also suggest that proper melatonin supplementation may also play a beneficial role in fertilization rates and embryo quality. Does Melatonin Supplementation Pose Any Risks to Pregnant Women or Cause Side Effects? The hormone is believed to not pose any significant danger to pregnant women, assuming they take the drug under the supervision of and at the dosages suggested by their physicians, typically in dosages of 3 mg or less. As with any new supplementation, women should inform their doctors of any unusual symptoms that might occur after beginning a therapeutic regiment. Some of the common side effects that can occur include headaches, drowsiness, dizziness and stomach irritation. In addition, caution should be exercised while driving, or the activity should be avoided altogether after taking the substance. Due to its effects on hormone balance and replacement, side effects may occur if the mother’s natural melatonin levels are over or under the normal rates. What are the Effects on Fetuses? During pregnancy, the melatonin levels of the mother are constantly on the rise. The hormone can cross the placenta and is present in the amniotic fluid as well as in the developing fetus, which already possesses melatonin receptors in the brain. Melatonin has different functions for the unborn child, including playing a major role in the activation of important genes. These genes are pivotal for proper development—all the way from the time of conception through birth. 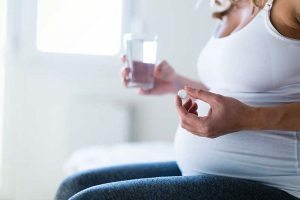 Expecting mothers that exhibit low melatonin levels are more likely to have a variety of pregnancy complications that can have a dramatic impact on both the mother as well as the growing baby. As a fetus begins to grow, the unborn child’s brain becomes more susceptible to injury as it develops. Should a fetus sustain a brain injury, the mother could suffer a miscarriage as a result. In cases where miscarriage is not a result of fetal brain injury and the unborn child survives, he or she could be subjected to serious, major disorders such as hearing, speech and/or sight impairments, cerebral palsy and/or potential motor deficiencies. Although studies are still in the early stages of development, research suggests that the use of melatonin by a mother during pregnancy might offer protection to her unborn youngster’s brain and offer further protection from fetal brain injury. While melatonin is known for helping people cope with insomnia, it may provide short and long-term, positive effects for expectant mothers and their unborn children. A mother, if she takes the substance responsibly and under the supervision of a doctor, can regain control of her sleep patterns and obtain the optimal rest critical for her own and her child’s health. In addition, a mother’s supplementation of melatonin may also prove to provide an unborn child’s brain the extra protection it needs from an injury that could cause serious, possibly fatal outcomes. Moreover, it has been demonstrated that the hormone also has a neuroprotective effect in both the adult brain and in the brain of the fetus. The effect of melatonin in the fetal and neonatal brain has already been documented in multiple animal studies. These demonstrated that the occurrence of inflammation and cell death could be reduced. A newer study showed that treatment with melatonin reduced oxidative stress before and during temporary cases of severe fetal asphyxia, stopped the formation of hydroxy radicals in the fetal brain, reduced lipid peroxidation and stabilized the blood-brain barrier. Additionally, it could be proven that melatonin significantly decreased oxidative stress when administered orally to newborns with birth asphyxia (i.e. the inability of the child to breathe regularly after being born). When it comes to adequate melatonin supplementation, not all melatonin supplements on the market serve the best purpose during pregnancy for optimal benefits. While there are a slew of slow- and fast-released melatonin, for proper absorption and optimal benefits, look for a melatonin supplement that is a controlled release formula which will provide the melatonin to your system as long as possible. This type of controlled time-release of melatonin, as oppose to fast or slow, will mimic the body’s natural release cycle, and provide a natural supply of the hormone, providing you and your developing baby with the best option for benefits.